It’s well past time for me to spend a few minutes reflecting on An Event Apart in 2010. In two words: absocrazifreakiperfluously staggerblasticating. [I totally stole those. —Ed.] From the first show to the last, 2010 was an incredible year for An Event Apart, easily our best yet on every front. Jeffrey and I stand in humbled awe of the amazing speakers and wonderful attendees who joined us this year. I’ve said before that AEA attendees are “as much colleagues as anything else” and that continues to be so. While I love our speakers, I love the attendees even more. What I look forward to most at every show is time spent talking with my fellow craftspeople in the hallway, at lunch, and at the social events. So in 2011, we’re building on what we learned in 2010. We’re going from five to six shows, including a long-delayed return to Atlanta (site of our sophmore effort), and each sporting an optional A Day Apart featuring in-depth coverage of topics like mobile web design, HTML5/CSS3, and content strategy. If you’re interested, check out our Events page for the show nearest, or of most interest, to you. Again, our deepest thanks to all our attendees and supporters. We couldn’t do what we do without you, and we’re looking forward to the challenge of clearing the bar you’ve set for us! 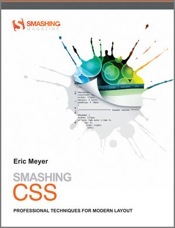 What’s different about this book as compared to others I’ve written is that this is a collection of short tips, tricks, and techniques for using CSS in everyday work. Many of them involve making changes and seeing the results, similar to my New Riders books, but where those books had chapter-long projects these are usually only a page or three in length. Well, okay, a few get up towards ten pages, but only on occasion. Another difference is that Smashing CSS spans the spectrum from basic tools and browser features that can speed your development and debugging to some cutting-edge ideas and a taste of the latest CSS3 hotness. I really do hope there’s something in it for everyone, and with something like a hundred entries, I think my odds are pretty good. I’m especially happy that it’s in full color, which allowed me to do lots of screenshots as well as color-hinting of the markup and CSS, and personally I think it looks awesome. I hope you’ll agree. Check out the official catalog page at Wiley or comparison-shop at ISBN.nu, and thanks! Update 6 Dec 10: So far I’ve found the Kindle (mobi) and Nook (ePub) versions of the book. Finding a good (read: legal) PDF version is proving difficult, so if anyone’s seen it out there, let me know so I can link away! I just spent the last hour or so reading through the comments and, let me tell you, I can’t express how much they helped me! It is now clearly obvious to me that finishing my CS degree is the way to go. A CS degree can make me a better web developer by teaching me about algorithm design and analysis, performance issues, and just how to think like an engineer. Also, since the web changes constantly, a degree will help me embrace those changes. It will always be there for me to fall back on if the web industry doesn’t work out for me. Thank you to everyone who contributed to the discussion, either in the comments here or elsewhere on the net. You made a positive difference in this world. Take pride in that, for it is the most important thing any of us can do. I had planned to spend yesterday goofing off, as is my tradition for the day after I return from a conference and don’t have anything immediately pressing on my plate. Instead I watched and documented, as best I could, a case of memetic epidemiology happen in realtime. The meme was the Cooks Source story, which I stumbled across relatively early in the day. I won’t recap the story here, as the original LiveJournal post by Monica Gaudio and Edward Champion’s very well-researched article do a much better job of that. The latter piece is particularly commendable if you’re new to the story, as it not only explains the genesis of the incident but also lays bare a number of other things that were discovered as the story went ballistic. I’m not sure exactly where I first came across the story—probably a retweet of Adam Banks by a friend of mine—but at the time the meme was really just getting started. At that point there were quite a few people posting on the Cooks Source Facebook Wall to chastise the editor, and the rate of posting was accelerating. I threw in my own tweet on the topic and kept watching the Wall to see if there would be a response, if the Facebook page would be deleted, or something else. At the same time, I was seeing more and more tweets and retweets of the story, and based on just what I could see, it seemed primed to go crazy. I was rewteeted by swissmiss, who has four times as many followers as me (and way more influential followers than me), and it was hitting the feeds of more and more people I follow. When it showed up on John Scalzi’s tweet stream, I actually got a little dizzy. This was the moment where I felt like the scientist at the beginning of a viral-apocalypse movie, staring at a monitor showing the sites of reported infection in red. Then, in a burst of tense, ominous music, the dots show up in New York City and around JFK. Game over. I got that feeling because I knew that not only is Mr. Scalzi followed by both Neil Gaiman (1.5 million followers) and Wil Wheaton (1.7 million followers), but he is respected and therefore paid attention to by both. Furthermore, both, as net-savvy content creators like Mr. Scalzi, are exquisitely sensitive to such stories. It was only a matter of time before one of them passed the story on to their followers. And sure enough, within minutes, Neil Gaiman did so. At that point, it seemed only a matter of time before traditional media channels took interest, and though it took a little while, many did. It literally became an international news story. Throughout the day, I tracked the situation and tweeted about it as new developments happened. I almost couldn’t help myself; I was completely captivated by watching a meme unfold and spread in realtime. Eventually I hit on a crude measurement of the story’s reach, which I dubbed the Speed of Chastisement (SoC). This was measured by loading the Cooks Source Wall and then scrolling to the bottom of the page, down to the “Older posts” button. The time elapsed since the last of the Wall posts was the SoC. When I started looking at it, it was measurable in minutes, but as the day went on the interval dropped. At one point, it was as low as 34 seconds, and may well have dropped lower when I wasn’t looking. I wish I could’ve automatically captured that number, say, every minute, because the timeline graph I could make with that data would be fascinating—especially if mapped against various developments, like Neil Gaiman’s retweet of John Scalzi or the time of various article publications. One of the things I found most fascinating was how the outraged mob used Cooks Source’s own digital presence against it. I don’t actually mean all the Wall posts, which served as an emotional outlet but otherwise only indicated the story’s memetic velocity (the SoC I mentioned earlier). What people did was start new threads in the Discussions tab of Cooks Source’s own Facebook page to document the original sources of Cooks Source articles and to compile the contact information for all of the advertisers in Cooks Source. The speed at which the crowd operated was awesome in the older sense of that word as inspiring of awe, which is itself defined as power to inspire fear or reverence. As I told a friend, I was fascinated in the same way I’d be fascinated watching, from a distance, a predator hunting down its prey. Awe-struck. It was almost frightening to watch how fast people tracked down the various text and image sources, uncovering more and more evidence of bad behavior at full-bore, redlined Internet speed. On a related point, I was very impressed by the quality of reporting in Edward Champion’s article about the story. Alone of all the articles I’ve seen (beyond the first couple of LJ posts), his laid out specific examples of repurposed content, and furthermore he had talked to people involved and gotten their perspective and to people at some of the sites and companies whose material had been re-used. Read the article, if you didn’t already follow one of the links. It is investigative journalism done far better than any reporter has yet done for any traditional, or even “new media”, news outlet. I could write about all this for much longer, but I’m going to hold off. My day wasn’t all just observation and tweets, though. A few questions kept hovering in the back of my mind. What if the mob had been wrong? Imagine with me for a moment that a small crocheting magazine is accused of copyright violation by an author. The editor, knowing this to be false, sends a dismissive or even sarcastic letter (we’ve all done it). The author posts their side of the story and excerpts of the letter to their blog, people notice, and suddenly the Flash Mob of Righteousness is back in business. What then? Is it possible, once the rope is out and being tied into a noose, to put it away again? Did Cooks Source actually win? As I write this, about 24 hours after the story really blew up, the Cooks Source Facebook page has gone from 110 people who “Like This” to almost 3,400. Most of those are because in order to comment on the Wall, you have to Like the page, and a whole lot of people hit “Like”, commented, and then hit “Unlike”. Some of them are still listed because they’re still posting. Still, assume that by the time it’s all over, between people who want to keep harassing Cooks Source and people who just forgot to hit “Unlike”, they’ll have well over a thousand people listed. That’s a full order of magnitude jump in claimed like. Is that a measure of success? Will it, in fact, end up a net positive for Cooks Source as it tries to entice advertisers for future issues? Of course, that assumes the magazine survives the attention of lawyers from Disney, Paula Deen Enterprises, Martha Stewart Living Omnimedia, the Food Network, Sunset, National Public Radio, and so on and so on. A few weeks back, Gene Simmons (of KISS fame) said that anyone who illegally shares files should be “sued off the face of the earth” and that bands should be litigious about people copying their music. In response, his web site was cracked and a good deal of derision was directed his way. Interesting. In one case, a content creator who calls for vigorous defense of copyright is attacked for it. In another, a violator of copyright is attacked. How many of the people who Wall-bombed Cooks Source’s Facebook page were also cheering the anonymous crackers who harassed Gene Simmons? Why the disconnect? There are many reasons we could cite, and I think the most likely factor is that in both cases, the targets of attack were publicly arrogant and uncompromising about their positions. That, however, is absolutely no excuse. If you were outraged by Cooks Source, shouldn’t you cheer Gene Simmons’ stance? If you rolled your eyes Gene Simmons, shouldn’t you be on the side of Cooks Source? I imagine there are people who did one or the other of those things. But not many. The contrast says something about how we collectively view intellectual property, and it may not be something we want to face. This isn’t the first time someone will set off an outrage swarm, and it won’t be the last. There is much to think about here, about both ourselves and the medium we inhabit. It’s that time again: the 2010 edition of The Survey For People Who Make Websites is open and taking your input. If you’re someone who creates web sites, whether all the time or some of the time or even just occasionally, please take just a little bit of your day (as I write this, the average time-to-completion is just over 10 minutes) to let us know about you. Furthermore, please spread the word to any groups to which you belong—local SIGs, mailing lists, newsgroups, forums, message boards, and so on. I truly believe it’s important to the profession as a whole to have as many web folks as possible participate. I think it’s a vital investigation, a look into our profession that nobody else is even attempting and is… essential if we’re going to be taken at all seriously by anyone other than ourselves. And even more vital than that, it tells us who we are, collectively speaking. We’re scattered. Many of us are solo. We don’t even know what kind of community we’ve joined. The Survey, though limited and imperfect, tells us something profound and essential about us. That’s why I’ve wholeheartedly supported this effort from its very outset, putting in hours upon hours of thought and effort into its operation and approving the use of [funds] to pay for professional analysis. This matters. Other professions have it easy: they require certification or degrees or membership in a professional organization before you can take part. Because of that, they can often estimate to a reasonable degree, or even count directly, how many of them there are. They can go to their membership rolls and survey a few thousand randomly picked members to find out their age, location, experience, salary, and anything else that seems interesting to know. We who build the web don’t have that luxury. Our profession, just like the medium it serves, has no gatekeepers, no central organization, no clear boundaries. The Survey is our attempt to disambiguate ourselves. So please, if you’re someone who makes web sites, take ten minutes to tell us about yourself. If you know people who make web sites, please point them to the survey and ask them the same. Thank you. A Textile Filter for BBEdit? A few days back I tweeted a request for a Textile filter for BBEdit, which is one of those things people have asked for over the years but has never actually appeared. There’s been a Markdown filter since forever, but since I find myself on Basecamp a lot for business reasons and Basecamp uses Textile I’d really prefer to stick to one syntax instead of constantly confusing myself by switching between two similar syntaxes. In response, the mighty Arlen Walker told me how to install Xcode, the Text::Textile module, and a short Perl script to drop into ~/Library/Application Support/BBEdit/Unix Support/Unix Filters. I did that, and it all worked, but I was unhappy with the <span class="caps"> that default Textile litters all over. I tried to disable it, failed, tweeted for help, and was contacted by the incredible Brad Choate (who wrote the Text::Textile module!). The upshot of all this is that Brad not only told me how to disable the spans, but how to convert Textile to a standalone BBEdit filter that, so far as I can tell, shouldn’t require installation of either Xcode or Text::Textile. I’m pretty sure about this, but since I’ve already installed Text::Textile I can’t be entirely certain. Who wants to test it out? This is _awesome_! "Arlen":http://theodicius.net/ and "Brad":http://bradchoate.com/ are the *bomb*. If you don’t mind (or even like) those spans, then of course you can slip that part. The “SA” in TextileSA.pl stands for “StandAlone”, by the way. I’ll drop that once I’m sure this actually works and pass it along to the BBEdit gang.